Fall colors – blue trees? A drive around Manchester near the Currier Gallery of Art will surprise you these days – where fall reds, oranges, and golds will mix with – blue? By the time of this publication, nearly 100 trees in Pulaski Park, Victory Park and on the campus of the Currier will have been painted with an environmentally safe electric blue paint, a community outdoor art installation by sculptor and performance and installation artist Konstantin Dimopoulos, and sponsored by the Currier Gallery of Art. With full approval of the Forest Society, the installation is a community-participatory project. On Sept. 30, the Currier organized a community art day, inviting members and the public to paint trees with a blue paint that within a few weeks, will wash away. The project is the result of a collaboration of the Currier, local arborists and foresters to identify which trees will be colored, to ensure the utmost environmental stewardship with this art installation. 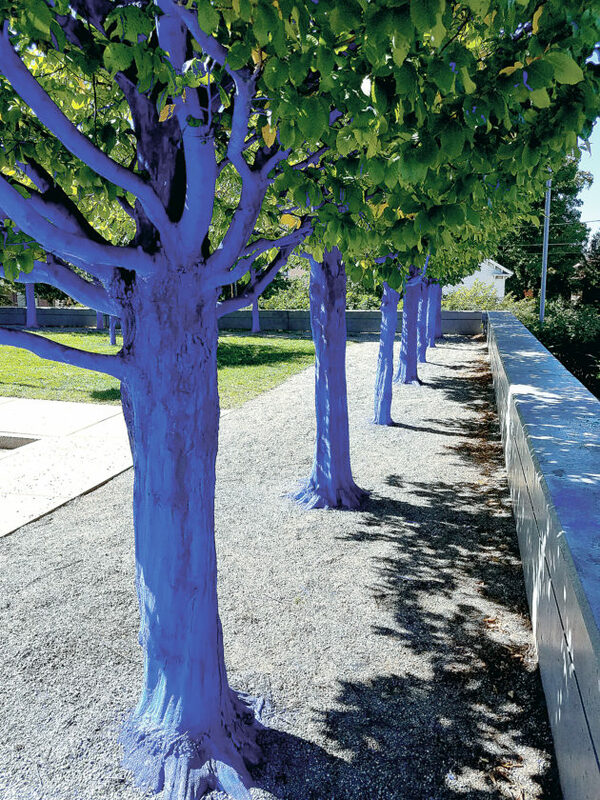 Since the debut of “The Blue Trees” at the 2011 Vancouver Biennale, Dimopoulos has since created a Blue Trees installation in Sacramento, California; Seattle, Washington; Albuquerque, New Mexico; Norcross, Georgia; Houston, Texas; Galveston, Texas; Breckenridge, Colorado; Jacksonville, Florida; Gainesville, Florida; and in Singapore; Germany; Sydney, Australia and in New Zealand. Dimopoulos, a native of Egypt, born to Greek parents, grew up at the mouth of the Suez Canal until age 8, when the family moved to Wellington, New Zealand. He is interested in moving art outside the museum and into people’s daily life, into the very pathways where they walk, dramatically demonstrating a link between concept and space to highlight the global ecoside of our forests and to inspire a social change in consciousness about trees. New Hampshire, as the second-most forested state in the nation, has a long early legacy of protecting forests. In fact, the story of William Wentworth Brown, New Hampshire’s 19th century forestry pioneer and visionary, is surprisingly relevant today because Brown cared about how he treated the forests, as well as the people who worked in the forestry industry. The Northern Forest stretches from Watertown, New York to Fort Kent, Maine. It includes 23 million acres of private land, 5 million acres of public land, 2.5 acres of wetlands, 7,000 lakes covering 1 million acres, with only 50 people per square mile. Geographically, Berlin, New Hampshire, is the center of this region. From the 1860s-1930s, W.W. Brown transformed Berlin into an industrial city, combining prudent land use with keen management of forest resources. He inspired his third son, William Robinson Brown, to carry on this important legacy. W.R. Brown took forest management to new heights, pioneering the idea of “sustainable yield.” These forest management directives included studying forest science; original research on tree growth and genetics; running the largest private tree nursery in the U.S.; and developing pioneering methods in woods safety programs. In 1901, W.R. Brown became a founding member of the Society for the Protection of New Hampshire Forests, the first society of its kind in the nation. This kind of legacy speaks for itself – it also speaks to the future. Anderson refers to a sobering report entitled “New Hampshire Everlasting,” that warns us of what can interfere with protective land management. Such conservation would focus on five areas: working forests, water quality, community character, wildlife habitat, and productive farmland. As you admire October’s magnificent palette and drive by those jarring blue trees, contemplate the vision of one forester in Berlin, New Hampshire in 1860, who cared enough about future generations to conserve – and by doing so, literally created our beautiful state as it is today. It does matter what we do today. Art is Nature, and Nature, Art.